Button Fly Boxer Briefs- Great for STP! 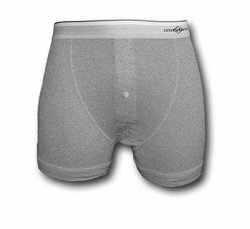 TranZwear > Packing Underwear W/BulletBrief Inserts > Boxer Briefs/Trunks > Boxer Briefs > Button Fly Boxer Briefs- Great for STP! We found a few brands who now make a soft cotton boxer brief with button fly. This is the answer to STP use! Easy to undo one or two of the buttons to access your STP without having to flip down your waistband. Thru the gate rather than over the fence ...as they say..lol. We offer a couple types of inserts to hold your packer/STP making it accessible to seal to your body while holding the shaft outside the fly. This is sold as one pair. Photos show examples of colors we may stock. We offer BulletBriefs AllnOne insert, See link to the different inserts, this pouch based insert with split back keeps the silicone off your body, allows access to sealing the STP against your body while allowing the shaft to pop thru the buttons. The drop C ring is a simple C ring attached to elastic and the packer is against your skin. The final insert is the FreeBall, not meant for STP's that uses the ball sac as part of the seal, but receptacle based STPs similar to the ones we sell on the site using Mr Limpy or Packer Gear packers.. We buy these in assorted packs of colors. Blues, greys, stripes. You can list your favorite color in comments and we'll use if available in your size.